The sickle cell test screens for sickle cell anemia in the blood. The sickle cell blood test is sometimes performed to meet NCAA requirements. A sickle cell lab test checks for the presence of sickle cell anemia in the blood. Why is a sickle cell blood test important? The sickle cell test screens for sickle cell disease and is often required by NCAA. This Sickle Cell Test is a blood test. This sickle cell test, sometimes known as a hemoglobin solubility test, sickle cell lab test, or a sickle cell blood test, screens for sickle cell anemia in the blood. This sickle cell blood test is used to check for the presence of sickling hemoglobins such as hemoglobin-s (Hb-S) or hemoglobin c-Harlem (Hb Ch). During vigorous exercise or in other conditions of body stress (e.g. high altitude, infection or surgery), people with sickle cell anemia can experience something called a sickling crisis. During a crisis, the red blood cells transform from malleable cells into rigid, sickle-shaped cells that can obstruct small blood vessels. The obstructed blood vessels are unable to deliver adequate blood flow to tissues, leading to pain and tissue damage. The NCAA often requests a sickle cell test prior to participation in college athletic activities because athletic activities are can precipitate a sickle cell crisis. Occasionally, sickle cell testing is performed prior to marriage, foreign travel, or organ donation. This sickle cell lab test only checks for sickle cell abnormalities where the anemia blood test panel checks for more commonly found types of anemia. To get a sickle cell test near you, order online and get tested at the Quest Diagnostics lab that you chose. Once your sickle cell lab results are ready, they can be downloaded. 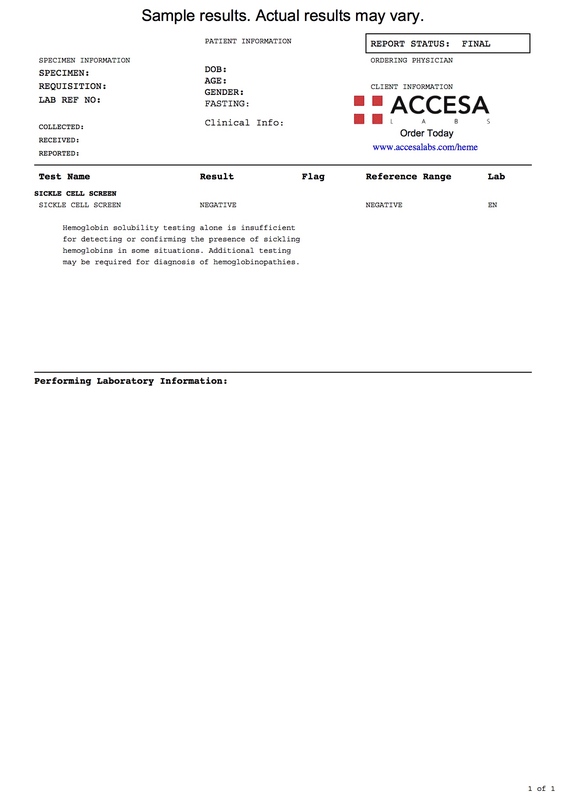 As can be seen on the sample sickle cell lab report above, the sickle cell screen results will be resulted as a positive or negative result. Unusual infections are often common in people with active sickle cell disease. For example, tuberculosis can occur more frequently in people with sickle cell disease which is why concurrent test with the QuantiFERON TB blood test is sometimes done at the same time as sickle cell testing. Sickle Cell Test at Guaranteed Prices.